For the later battle leading to the establishment of the Kingdom of Pamplona, see Battle of Roncevaux Pass (824). For the battle in the Peninsular War, see Battle of Roncesvalles (1813). The Battle of Roncevaux Pass (French and English spelling, Roncesvalles in Spanish, Orreaga in Basque) in 778 saw a large force of Basques ambush a part of Charlemagne's army in Roncevaux Pass, a high mountain pass in the Pyrenees on the present border between France and Spain, after his invasion of the Iberian Peninsula. The Basque attack was a retaliation for Charlemagne's destruction of the city walls of their capital, Pamplona. As the Franks retreated across the Pyrenees back to Francia, the rearguard of Frankish lords was cut off, stood its ground, and was wiped out. 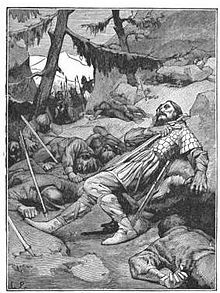 Among those killed in the battle was a relatively obscure Frankish commander, Roland, whose death elevated him and the paladins, the foremost warriors of Charlemagne's court, into legend, becoming the quintessential role model for knights and also greatly influencing the code of chivalry in the Middle Ages. There are numerous written works about the battle, some of which change and exaggerate events. The battle is recounted in the 11th century The Song of Roland, the oldest surviving major work of French literature, and in Orlando Furioso, one of the most celebrated works of Italian literature. Modern adaptations of the battle include books, plays and works of fiction, and monuments in the Pyrenees. With the rise of the Carolingians and Pepin the Short's war on Aquitaine, the Duchy of Aquitaine led by Waifer was defeated and the Franks encroached farther into the duchy. The Basques (Vascones, Wascones) of the Duchy of Vasconia, one of the mainstays of the Aquitanian army, submitted to Pepin in 766 and 769, but the territory south of the Garonne remained largely unscathed and self-governed. However, as of 778 Charlemagne expanded Frankish takeover of Aquitaine to present-day Gascony, by appointing trusted Franks, Burgundians and Church officials in key regional positions and establishing counties, such as Fezensac, Bordeaux, and Toulouse, on the left bank of the Garonne. Sulayman al-Arabi, the pro-Abbasid Wali (governor) of Barcelona and Girona, sent a delegation to Charlemagne in Paderborn, offering his submission, along with the allegiance of Husayn of Zaragoza and Abu Taur of Huesca in return for military aid. Their masters had been cornered in the Iberian peninsula by Abd ar-Rahman I, the Umayyad emir of Córdoba. The three rulers also conveyed that the caliph of Baghdad, Muhammad al-Mahdi, was preparing an invasion force against Abd ar-Rahman. Seeing an opportunity to extend Christendom and his own power, Charlemagne agreed to go to Spain. Al-Arabi induced him to invade al Andalus by promising him an easy surrender of its Upper March, of which Zaragoza was the capital. Following the sealing of this alliance at Paderborn, Charlemagne marched across the Pyrenees in 778 "at the head of all the forces he could muster". Charlemagne led the Neustrian army over Vasconia into the Western Pyrenees, while the Austrasians, Lombards, and Burgundians passed over the Eastern Pyrenees through Catalonia. His troops were welcomed in Barcelona and Girona by Sulayman al-Arabi. As he moved towards Zaragoza, the troops of Charlemagne were joined by troops led by al-Arabi, before eventually putting the city in a siege. Abd ar-Rahman of Córdoba sent his most trusted general, Thalaba Ibn Obeid, to take control of the possibly rebellious city and to prevent the Frankish invasion. Husayn and Ibn Obeid clashed repeatedly; eventually Husayn managed to defeat and to imprison Ibn Obeid. Reinforced in his autonomous position, Husayn became reluctant to yield his new privileged status to the Frankish monarch and refused to surrender the city to Charlemagne, claiming that he had never promised Charlemagne his allegiance. He seems to have tried to appease Charlemagne by giving him the prisoner General Ibn Obeid and a large tribute of gold, but Charlemagne was not easily satisfied, putting Sulayman al-Arabi in chains. Meanwhile, the force sent by the Baghdad caliphate seems to have been stopped near Barcelona. Though initially having the upper hand, the siege of Zaragoza dragged for over a month. 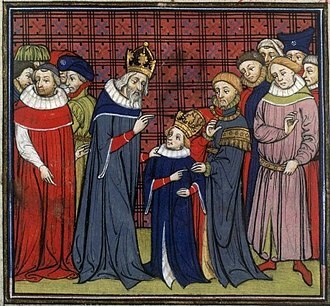 Eventually a deal was struck between Charlemagne and Husayn. The latter would pay gold and the release of several prisoners, while the Franks in return would withdraw their siege. Before leaving the Iberian peninsula he decided to further secure his hold on the Basque territory (Wasconia). Charlemagne first eliminated any possible opposition from the natives of the region (the Basque tribes), believing that many of them were allied with the Moors. He gave orders to tear down the walls of the Basque capital Pamplona, possibly fearing that it could be used for future conflicts. Some primary sources suggest that he destroyed the city altogether, and many towns in the region were also razed. Garrisons and military outposts were placed throughout the territory, and there were accounts of the Franks' harsh treatment of the Basques during their occupation. After securing the region, Charlemagne marched for the Pyrenees mountain pass to return to France. Many of his notable lords, such as Roland, military governor of the Breton March, and Eggihard, Mayor of the Palace, were placed in the rearguard probably to protect the retreat and the baggage train. Unknown to Charlemagne, the enraged Basques sent their warriors in pursuit of him and his army in retaliation for the destruction of their city, and the Basques' knowledge of the region helped them overtake the Franks. Having decided to return, [Charlemagne] entered the mountains of the Pyrenees, in whose summits the Vascones had set up an ambush. They attacked the rearguard, causing confusion which spread to all the army. And, while the Franks were superior to the Vascones both in armament and in courage, the roughness of the terrain and the difference in the style of combat made them generally weaker. In this battle were killed the majority of the paladins that the King had placed in command of his forces. The baggage was sacked, and suddenly the enemy vanished, thanks to their knowledge of the terrain. The memory of the injury so produced overshadowed in the King's heart that of the feats done in Hispania. One of the principal units of the Vascones was the guerrilla army of the Basques. A later source, the anonymous Saxon Poet, talks of the Basque spears, agreeing with the Pyrenean and Basque tradition much later among the almogavars. A typical Basque mountain warrior was armed with two short spears and a knife or short sword as his main weapons, and bows or javelins for missile weapons. He would not normally wear armour. Pierre de Marca, a Béarnese author, suggests that the attackers were a reduced number of mostly local Low Navarrese, Souletines, and Baztanese, whose main motivation may have been plunder. The Vascones have a history of resisting Carolingian rule since the incursion of Frankish king Pepin the Short, which saw the defeat of Waiofar, the last independent Duke of Aquitaine. The accounts of Einhard and Pierre de Marca suggest that the perpetrator of the attack was Lupo II of Gascony. He held the territory of the Pyrenees, making him responsible for the tragedy that happened in his realm. Regions surrounding his kingdom such as Bordeaux were under the control of the Carolingians. 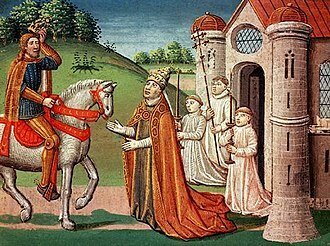 While the Duke did pay homage to Charlemagne by offering Hunald II (a rebel leader and a possible heir to Waiofar) and his wife to him, there were disputes over the trans-Pyrenean Basques lands ruled by Lupo and those under Carolingian suzerainty. The authors of the General History of Languedoc also believed in the same theory that the Duke was the leader of the attack. Their reasons were that he and the Vascones opposed Carolingian expansion into Vasconia after the Franco-Aquitanian war (760–769). Map of the roads in Hispania. The pass of Roncesvaux is located on the Ab Asturica Burdigalam road that started in Castra Legiones to Benearnum and meets Burdigala. The Pyrenees are a mountain range in southwest Europe that form a natural border between France and Spain, extending about 490 km (305 m) from Cap Higuer on the Bay of Biscay, to Cap de Creus on the Mediterranean Sea. The range also separates the Iberian Peninsula from the rest of Western Europe. Beyond the Northern part of the pass lies much of the French frontier and wilderness. The mountains are older than the Alps and have an elevation of 1,777 m (3,862 feet). These descriptions have suggested various places from which the battle could have taken place, ranging from Navarre and Aragon to as far as Catalonia. The mainstream opinion is that the battle took place somewhere not far from Roncevaux itself, as it is not just on one of the easiest routes but also the traditional one. Indeed, the Roman road "Via ab Asturica Burdigalam" which started in Castra Legiones (current León) and went to Benearnum, crossed the Pyrenees through Roncevaux. However, the traditional Roman road (also called the Route of Napoleon) followed a route different from the modern one, not crossing at Ibañeta (the traditional location) but heading up eastwards and crossing instead the Lepoeder and Bentartea passes—next to the mount Astobizkar—not far from the mount Urkulu, identified as the Summum Pyreneum of the classic Roman sources. Charlemagne biographer Einhard stated that the men in the rear were "massacred to the last man." The Vita Karoli mentions the names of the most important lords killed such as Eggihard, Roland and Anselmus; the Palatine Count. The battle caused numerous losses among the Frankish troops, including several of the most important aristocrats and the sack of the baggage, probably with all the gold given by the Muslims at Zaragoza. While the skirmish was a small setback, Charlemagne did lose huge quantities of treasure and good men. It was the only significant defeat that Charlemagne ever suffered in his otherwise successful military career. Never again would Charlemagne take it upon himself to lead an army to battle in Spain, having to rely instead on his generals for future campaigns in the Iberian Peninsula. The Franks failed to capture Zaragoza and suffered a significant loss at the hands of the Vascones, but Charlemagne would return to establish the Marca Hispanica, to serve as a buffer region between his Christian empire and the Muslims to the south. A decade later the Franks finally captured Barcelona. He would also later establish the Kingdom of Aquitaine with the son of Louis the Pious as its first king. Land in the Pyrenees would be overseen by Carolingian officials, and distributed among colonisers and to the Spanish Church who were allied to Charlemagne. A Christianization program was put in place across the high Pyrenees. The Basque would continue their rebellion to Carolingian rule until the appointment of William of Orange, who would dissolve their rebellion after capturing and exiling Lupo's son and Basque leader Adalric in 790. Zaragoza, however, remained a Muslim city and capital of the Upper March, and later of an independent emirate until the 11th century. Pamplona, itself, would still remain in the hands of the Muslims and held until a rebellion in 798–801 expelled them as well. The Vascones would finally consolidate the Banu Qasi realm and eventually the constitution of the independent Kingdom of Pamplona in 824 after the birth of a new resistance to Carolingian rule. In that same year, the Basque army defeated another Carolingian army in the same mountain pass. The second Battle of Roncevaux Pass was almost similar to the first, with the Basques again taking advantage of the terrain, but against a much larger Frankish force. Unlike the first battle in which Charlemagne's army managed to escape, the Carolingians led by Count Aeblus were trapped and routed, and a larger number of men were slaughtered than those of Charlemagne's. Frankish vassals Aeblus and Aznar were captured by the joint forces of Iñigo Arista's Pamplona and of the Banu Qasi, consolidating the independence of both realms. Over the years, this battle was romanticized by oral tradition into a major conflict between Christians and Muslims although in fact, the Basques of the period were mainly Pagans and Charlemagne had been allied to some of the Muslims. In the tradition, the Basques are replaced by a force of 400,000 Saracens, and mythical objects such as durendal and oliphant were also added. 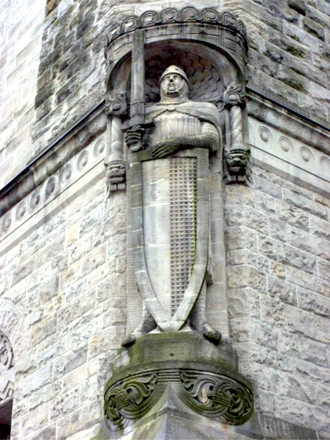 Although Roland died in the battle with little information about him, the battle popularized him as a chivalric hero of honor in the Middle Ages. The Song of Roland, which commemorates the battle, was written by an unknown poet of the 11th century. It is the earliest surviving of the chansons de geste or epic poems of medieval France in the langue d'oïl, in what would become the French language. Together with the Knights of the Round Table in Britain, the story of Roland and the paladins have become the archetypal icons of chivalry in Europe; greatly influencing knightly culture and inspiring many Christian warriors that came after. During the Battle of Hastings in 1066, knights and soldiers under William the Conqueror, chanted the poem to inspire themselves before their fight with the Anglo-Saxons. The English expression, "to give a Roland for an Oliver", meaning either to offer a quid pro quo or to give as good as one gets, which is referenced directly from the companionship of Roland and Oliver during the battle. One example was said during the Combat of the Thirty in 1351; a judicial combat between two groups of knights during the Breton War of Succession. The knights were described by the French author Jean Froissart as "if they had been all Rolands and Olivers," which admired their honor and companionship in battle. 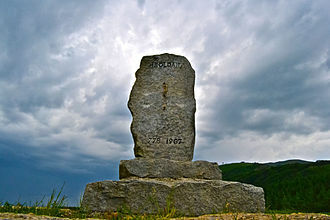 Memorials have also been erected to commemorate the battle, such as the Roncesvalles Pass Monument in Navarre, Spain. 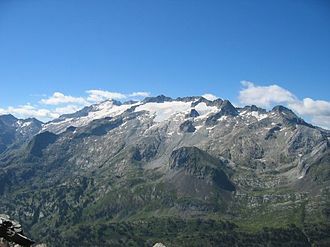 Roland's Breach, situated in the Ordesa y Monte Perdido National Park, is a gap thought to have been caused by Roland while fighting. At the summit of the Roncevaux Pass are the remains of an early chapel of San Salvador also known as Charlemagne's Chapel and the Charlemagne Monument built in 1934; both built to commemorate the Emperor's campaign in the region. The song is also commemorated in the Italian literary classic Orlando Furioso. The battle is also referenced in the song "Roncevaux" by Van der Graaf Generator, originally recorded in 1972 but only released in rather rough form many years later on the album Time Vaults. The battle and Orlando's sacrifice inspired several composers, amongst whom were Claudio Monteverdi, Jean-Baptiste Lully, Antonio Vivaldi and George Frideric Handel, who composed an Italian-language opera with Orlando. Modern adaptations of the battle drew heavily on the romanticized versions. A 1978 French film La chanson de Roland features an adaptation of the Song of Roland and features the battle as depicted in the poem. The battle is also featured minimally in the graphic novel The League of Extraordinary Gentlemen: Black Dossier, in which Roland is named Orlando, an amalgamation of fictional characters that were named Roland and Orlando. ^ a b c d "This Day In History: August 15, 778". History. ^ a b c Vicente, Rodriguez. "Orreaga; Roncevaux". Encyclopædia Britannica. Retrieved December 20, 2015. ^ a b c d Cline, Austin. "Charlemagne's Commander Roland Killed by Basques at Battle of Roncevaux Pass". Skepticism in History. ^ a b Hickman, Kennedy. "Charlemagne: Battle of Roncevaux Pass". Military History. ^ a b Lewis, Archibald R. (1965). The Development of Southern French and Catalan Society, 718–1050. Austin: University of Texas Press. pp. 38–50. ISBN 978-0-292-72941-4. Retrieved March 26, 2013. ^ a b "Roncesvalles". World Walking. Archived from the original on 2015-12-22. ^ Collins, Roger (1990). The Basques (2nd ed.). Oxford, UK: Basil Blackwell. p. 122. ISBN 0-631-17565-2. ^ a b c Baker, Patrick (January 23, 2014). "A legend grows". Karwasaray Publishers. Retrieved November 4, 2015. ^ Kearney, Milo. Further Studies in Rio Grande Valley History. University of Texas at Brownsville (2006). ASIN: B000NLBN3Y. ^ "William of Aquitaine, St.". Encyclopedia.com. Retrieved on 2014-01-17. ^ Auriga Ediciones (1982). La canción de Roldán (in Spanish). Ediciones Rialp. 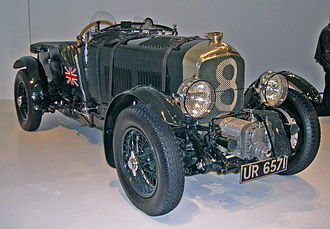 p. 5. ISBN 9788472810761. ^ Gareth Pullen (December 20, 2015). "THE BATTLE OF HASTINGS AND THE BEGINNINGS OF ANGLO-NORMAN ENGLAND". England and English History. ^ Craig Taylor (December 20, 2015). "Military Courage and Fear in the Late Medieval French Chivalric Imagination". Journal of Medieval and Humanistic Studies. ^ Leslie (September 3, 2015). "Day 1 St Jean to Roncesvalles". Camino Adventures. ^ Lodovico Ariosto. "Orlando furioso (Orlando Maddened)". Operapaedia. Archived from the original on 2016-02-17. ^ "Time Vaults". Van der Graaf Generator. Retrieved 2013-03-27. ^ John Rockwell (December 20, 1981). "Opera: Handel's 'Orlando' At American Repertory". The New York Times. ^ "New York Times: The Song of Roland". NY Times. Retrieved 26 October 2008. ^ Winter, Andrew; Moore, Alan (2007). "Northampton's Finest: Alan Moore Interview". Tripwire Annual 2007. Tripwire Publishing. pp. 12–17. ISBN 978-0-9543751-1-9. Lewis, Archibald Ross (1965). The Development of Southern French and Catalan Society, 718–1050. Austin: University of Texas Press. ISBN 978-0-292-72941-4. Lewis, David L. (2008). God's Crucible: Islam and the Making of Europe, 570 to 1215 (1st ed.). New York: W.W. Norton. ISBN 978-0-393-06472-8. Wikimedia Commons has media related to Battle of Roncevaux Pass. Earliest manuscript of the Chanson de Roland, readable online images of the complete original, Bodleian Library MS. Digby 23 (Pt 2), La Chanson de Roland, Anglo-Norman, 12th century, ?2nd quarter. The Battle of Golpejera known as Golpejar, was an internecine battle among Christian kingdoms fought in early January,1072. King Sancho II of Castile defeated the forces of his brother Alfonso VI of León near Carrión de los Condes and it is notable as being one of the battles in which El Cid participated. In the 11th century, the three kingdoms of Castile, León and Galicia had been united under the ruler, King Ferdinand I of León. 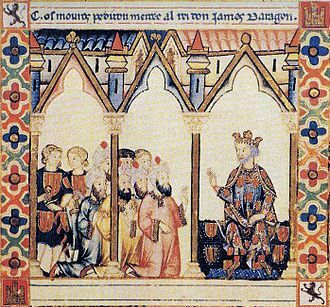 But his elaborate plans for succession led to years of infighting among siblings, if Ferdinand had followed the Navarrese Succession Law, his elder son, Sancho of Castile, should have receive either all or the most of the inheritance. The nobility of León, saw itself as the heir of the ancient Hispanic-Gothic kingdom. Castile until recently had been merely frontier county of León, ultimately, in a King Lear-like compromise, Ferdinand elected to divide among his sons his domains into three kingdoms. Alfonso would inherit León, García, and Sancho, to his two daughters and Elvira, he granted the towns of Zamora and Toro. The Siege of Coria in July 1138 was the first and shorter of two attempts to take the city of Coria by Alfonso VII of León. Coria had previously been reconquered in 1079 by Alfonso VI and it was lost to the Almoravids not long after Alfonsos death in 1109. On the heels of a successful razzia deep into Islamic al-Andalus, a second siege in 1142 was successful. The main source for the siege is the book of the contemporary Chronica Adefonsi imperatoris. The king brought with him physicians and surgeons, before investing Coria Alfonso sent plundering companies to the city to capture the men and all the livestock in the fields. The Corians responded with a sally, but the plundering troops feigned retreat and led the Muslims into a prepared by Alfonso. 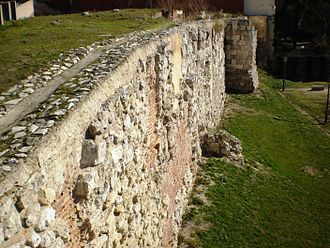 The city responded by shutting its gates and fortifying them with timbers, Siege engineers played a prominent role, but they played an even greater part in the second siege of Coria in 1142. The machines present are described by the Chronica as high towers that actually reached above the city walls, engines. The town was shut off and nobody was said to have been able to either leave or enter. The day before the assault on the walls had begun, Alfonso decided to go into the mountains to hunt deer and bear. The next morning the magnate led an assault on the walls. The arrow pierced both his headpiece and his corselet and the iron head struck his neck, finally Rodrigo said to those around him, Take off my arms, for I am extremely disheartened. Immediately they removed his arms and carried him to his tent, throughout the entire day they attempted to cure his wound. Around sunset all hope in medicine was lost, and he died, as soon as the news had spread through the camp, there was tremendous mourning—more than anyone had imagined. Upon returning from the mountains, the Emperor was informed of the Consuls death and he learned the cause upon entering the camp. Alfonso gathered all of his advisors, and in their presence, he appointed Osorio, Rodrigos brother, the next day Alfonso realizing his many misfortunes. The Battle of Alhandic, known as Zamoras trench Battle, was a battle that occurred on August 5,939 in the city of Zamora, Spain. 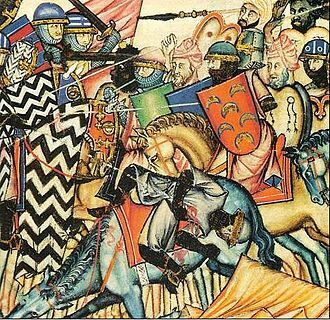 The battle occurred when the troops of Abd-ar-Rahman III assaulted the walls of Zamora, the defending troops were those loyal to Ramiro II of León, King of the Kingdom of Leon. The fighting was so bloody that the tide of the battle did not turn until the surrounding the city walls was entirely filled with corpses. The troops of Aberraman III won the day and were able to seize the city of Zamora and this battle should not be confused with the Day of Zamora which took place a few decades before in the year 901. Once Abd-ar-Rahman III came to power, he was quick to assert his power and he wanted to consolidate his power base and reestablish the internal order of the Emirate of Córdoba. He decided to go to the border and attack the cities that acted as a buffer against the Asturian / Leonese lands to the north. It was on this line that he came upon Zamora. The city was important because it was squarely in the path of march typically used by the Leonese troops. The Battle of Fraga was a battle of the Spanish Reconquista that took place on 17 July 1134 at Fraga, Spain. The battle resulted in an Almoravid victory, the Aragonese monarch Alfonso I died shortly after the battle. Specifically, they targeted the low lands around the Segre and Cinca Rivers all the way to the mouth of the Ebro, the most important towns in this region were Lleida, Mequinenza and Tortosa. In July 1134, King Alfonso I of Aragon the Battler, known by the Muslims as Ibn Rudmir or al-Farandji, the Almoravid response was swift and decisive. The Emir of Cordoba, son of the caliph, equipped a force of 2,000 knights, the Enur if Murcia and Valencia put together 500 knights, once these forces were joined together, they marched to the relief of Fraga. On 17 July 1134 brought the arrival of a Almohad relief force, led by the governor of Lérida, seeing reinforcements, the besieged Fragans sallied out, however Alfonso I, still confident in his numerical and tactical advantage, rallied his troops. The Battle of Estercuel took place on 6 July 975 between the forces of the Kingdom of Viguera, under king Ramiro Garcés, and those of the Caliphate of Córdoba, under the kaid of Zaragoza, al-Tuyibi. The battle, a skirmish of the Christian–Muslim frontier, was a victory for the Caliphate. Several leading Navarrese magnates were killed and Ramiro was injured, the forces of the Kingdom of Pamplona, under Sancho II Garcés Abarca, Ramiros half-brother, were engaged at Gormaz, where they were defeated alongside the Castilians under García Fernández. The kaid was on the road to Zaragoza when he encountered a Christian army under Ramiro Garcés, the chief source for the encounter is the Muqtabis of Ibn Hayyan, whose account of these years is derived directly from the so-called Anales palatinos of Isa ibn Ahmad-Razi. The disorderly Christians crossed the river Ebro at a ford and soon had lost four men, from the captive the kaid learned that the Christian army numbered some 500 cavalrymen who had marched from Sos, Ramiros chief castle, thinking that the governor of Zaragoza was away in Gormaz. The Battle of Clavijo is a mythical battle, to a serious historian, the existence of the Battle of Clavijo is not even a topic of discussion. However, it was believed for centuries to be historical, in the legend, the apostle Saint James, an associate of Jesus Christ who died a 800 years earlier, suddenly appeared and led an outnumbered Christian army to gain its victory. He became the saint of Spain and is known to Spaniards as Santiago Matamoros. Aspects of the historical Battle of Monte Laturce were incorporated into this legend, the date originally assigned to the battle,834, was changed in modern times to 844 to suit the inherent contradictions of the account. The day is given as 23 May. The legend as it survives was first written down about 300 years after the event on a spurious charter. 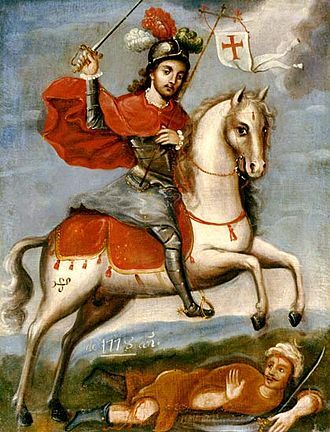 The history of the cult of Saint James is rich in such frauds, historian Jean Mitchell-Lanham says, While this event is based on legend, the supposed battle has provided one of the strongest ideological icons in the Spanish national identity. The walls of and trenches at Zamora. Model of Balborraz street, where the attackers' heads were displayed on pikes, in the Centre for the Interpretation of the Middle Ages Towns in Zamora, Spain. The Camino Real del Puerto de la Mesa where the battle took place. Place in La Rioja where the Castle of Cellorigo was situated, guarding the mountain pass. Ramiro III of León who abdicated the throne after the disastrous loss at Rueda. Field where the battle occurred. 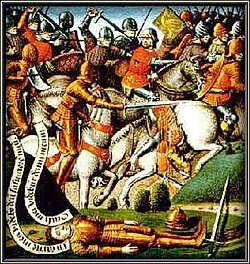 El Cid, slaying an enemy in battle, from a miniature of 1344. Peter receiving a shield emblazoned with St George's Cross. Castle of la Muela in Consuegra. Alfonso I of Aragon the Battler.